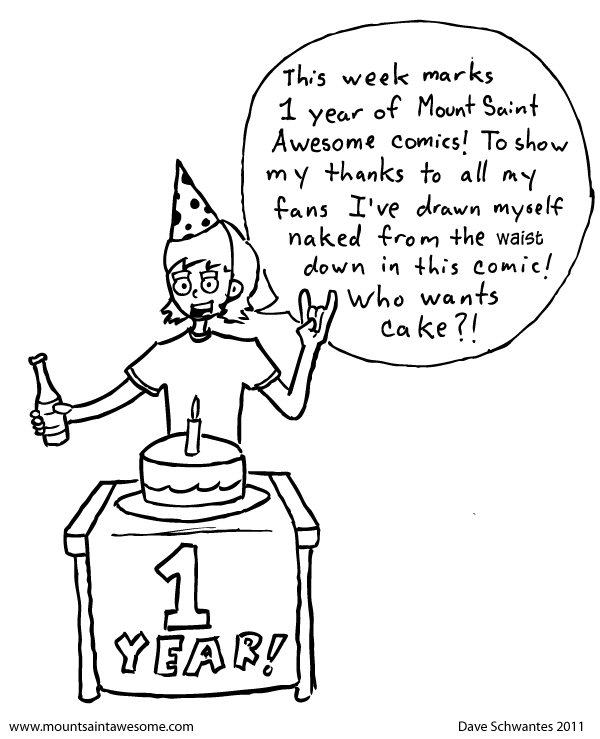 Mount Saint Awesome - 18: 1 Year of Awesomeness! 18: 1 Year of Awesomeness! So a year ago, I started posting comics to this web site. If you're interested, this is what the first comic looked like. Since then a lot of changes have been made and I like to think I've gotten better at this whole comics things. I just want to thank everybody who's stopped by to read or comment or send me a tweet or befriended me on Facebook. I honestly didn't expect to make it this far and I can't wait to see where Mount Saint Awesome goes in the years to come! Congrats! That's quite an accomplishment, keep it up!